One of the best innovations in recreational ice refrigeration is a reverse osmosis water treatment system. It results in water and energy savings and creates the best ice surface for athletes. Reverse osmosis removes the impurities that cause the equipment to work overtime. 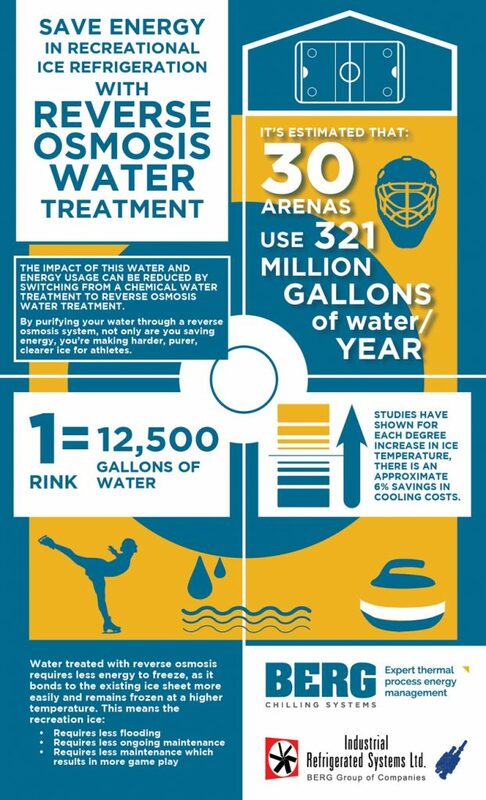 It’s estimated that 30 arenas use 321 million gallons of water each year. This is a major contributor to the consumption of water for cities. A single sheet of rink ice requires more than 12,500 gallons of water. That’s a staggering number, but the impact of this water and energy usage can be reduced by switching from a chemical water treatment system to the reverse osmosis water treatment system. Switching from a chemical water treatment to reverse osmosis water treatment removes impurities, creates better energy savings and a better skating experience. Reverse Osmosis water treatment removes impurities such as dissolved minerals and salts. The resulting water is almost pure H20. This purified water bonds more easily to the existing ice sheet without heating, and it will freeze and remain that way at a higher temperature. This purer ice is free of bubbles, particles and cracks and requires less flooding and maintenance, which in turn reduces the overall amount of water used in maintaining arena ice surfaces. The immediate energy usage benefit of using water treated with reverse osmosis is that it requires less energy to freeze, as it bonds to the existing ice sheet more easily and remains frozen at a higher temperature. This higher temperature on the ice surface is also an improvement for spectators because a warmer arena is more comfortable. In fact, studies have shown for each degree increase in ice temperature, there is an approximate 6% savings in cooling costs. Finally, ice made from reverse osmosis treated water has fewer imperfections, is harder, and requires less regular maintenance. This has an added benefit in reducing ongoing maintenance costs. By first purifying your water through a reverse osmosis system, you’re not only saving energy. You’re making harder, purer, clearer ice for skating and curling. Athletes can focus on their performance on harder ice with fewer holes and cracks. Because the ice is more resilient, it requires less maintenance, and this can also result in more game play, as well. This is great news for skaters and also for spectators, because they can enjoy a game with fewer interruptions. Cosmetically, there is also the benefit of sharper, clearer lines and logos on the ice. This improves the play of the game and makes the sponsors happy, too. The infographic below sums it up well. If you’re keeping score, that’s a clear win for impurity-free water from a reverse osmosis water treatment system. It offers many benefits: faster freezing, higher temperatures, less maintenance, better ice quality, and a better experience for athletes. Call us for information on the supply and service of reverse osmosis water treatment for ice rink refrigeration today.